Being aware of the impact we have on the environment has never been more important, and by using the guidance in The Eco Living Book, you can make a few simple changes to your lifestyle that will have far-reaching implications. Discover alternative energy, lighting, water, heating and recycling for your home; make the rooms in your house more eco-friendly, and learn how to grow your own food and g… o organic. 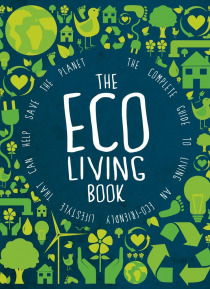 Green living is fun, and will greatly improve your health and that of the planet, so open up The Eco Living Book and take a fresh look at your home!Featuring: Back to Basics - Discover simple alternative energy-saving changes in your home, through heating, lighting water and recycling. The Green House - Take a look at your home, room by room, and consider small and fun ways to introduce more eco-friendly furniture and reduce waste. Green Growing and Eating - Learn how to grow your own food, no matter how big your outdoor space, and support eco-friendly agriculture by going organic. Resources - Find a list of invaluable resources for green companies, retailers, manufacturers, campaigning and information groups.